We ended a busy week at the Tulare County Cattle Drive Beef Boosters dinner last night to support the local 4H an FFA programs for kids. We bid on and brought home this one-of-a-kind hand woven wool saddle blanket designed and created by Linda Hayden, our Three Rivers cattle neighbor. She spins her wool, then collects and harvests plants from nature and boils these materials over an open fire to obtain the endless array of colors she uses to create her blankets. The water is then strained and the wool is submerged and soaked for several hours. At this time the wool is “cooked” over a slow simmering fire then left to soak for another 24-hour period. After the wool absorbs all the color it is washed several times and left to dry. Supporting only a few non-profits, Robbin I believe that the Tulare County Cattle Drive Beef Boosters is an investment in our future, not only for the cattle business, but for all of us by offering youngsters hands-on experience with livestock, work and responsibility, early in life. If you’re willing to wait two years for a blanket of your own, it’s $750–visit the link above, or if you want to bring one home, attend next year’s Beef Boosters dinner and bid against the crowd. This entry was posted in Photographs, Ranch Journal and tagged Linda Hayden, saddle blanket, Tulare County Cattle Drive Beef Boosters. Bookmark the permalink. 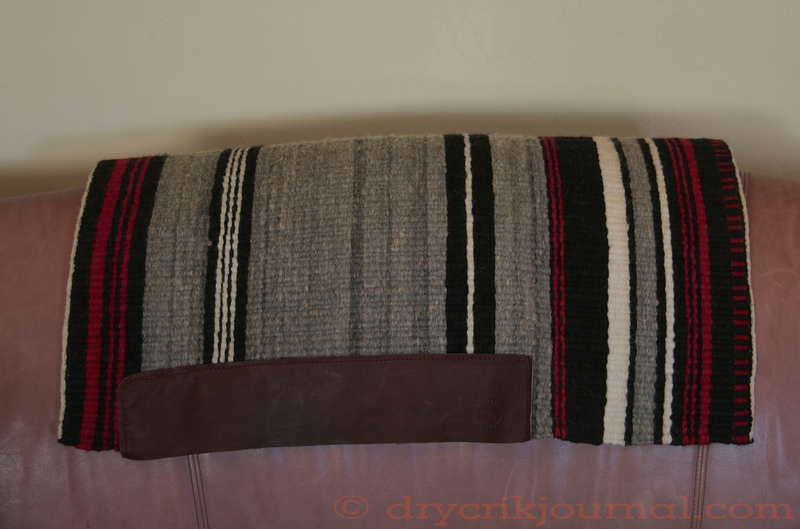 That is one handsome saddle blanket! If I had a horse now I might consider ordering one . . . Beautiful work! Indeed it is! A work of art, it may never see a horse. We’ll see. So wonderful to see things hand made and keeping traditions alive. Gathering and making her own dies I’m sure is almost a lost art in of itself. Did she happen to mention how many hours she put into making it? Probably a silly question considering the different aspects involved. Thank you, John. After asking I went to her web site. Very informative.